Seventeen councillors have been outed as being in favour of a controversial parking charge scheme which was thwarted by a weekly newspaper. 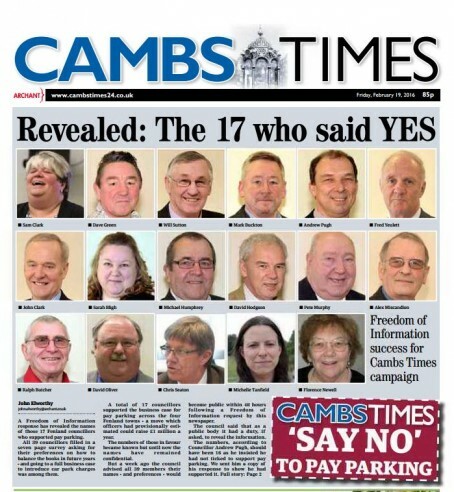 The Cambs Times has revealed the names of the members of Fenland Council who secretly backed introducing the charges in four Cambridgeshire towns after a Freedom of Information request was sent to the authority by editor John Elworthy. As previously reported on HTFP, the Times’s successful six day campaign against the charges’ introduction last month was described by John as “the shortest in my newspaper career”. In a front page story revealing its victory, the Times threatened to ‘out’ the 17 councillors who previously expressed backing for the proposal in an internal council discussion, with shadows replacing their headshots. Today the Times revealed their names, complete with photographs, on its front page. John said he felt the initial charging plan for the towns of March, Chatteris, Wisbech and Whittlesey had been “rather unfair”. He added: “Councillors were given a seven page document to fill in and to return to the council as part of a comprehensive spending review exercise. “One option was to tick a box inviting the council to go ahead with a business case that councillors were told could possibly reap a £1m a year profit from its car parks. “Figures aside, the overwhelming response in Fenland has always been that our towns are struggling hard enough as it it to make a living and many shopkeepers fear it could spell the end of their businesses if charging was to be brought in. Following John’s FoI, the council released a total of 85MB of data about options its 29 councillors want to pursue in a bid to balance the authority’s books. John had initially asked councillors if he could have sight of the responses – which covered a wide range of other topics such as possible closure of the leisure centres and removal of some local services – but was refused. As a result, the Times is now planning to publish the rest of the councillors’ ‘wish lists’ next week. John said: “Several councillors told me they had been assured the responses were confidential but I got an unofficial steer from within the council that an FOI might work – which is what we did. “All hell has broken out on social media in all four towns. Many people expressed surprise at learning which councillors had opted for pay parking – one councillor even phoned me late at night horrified his name was on the ‘yes’ list when he insisted he had said ‘no’. Accountability. That’s what local newspapers are there for. Chapeau Monsieur Elworthy.